I've had some poor sleeping habits/episodes in the past... hrm, year or so. On and off of varying medications, some self medicating, and general roving about my house mumbling under my breath about all the missed zzz's. After a lengthy, and no doubt highly scientific (guffaw) experimentation process, I have found the guilty party- Diet Coke. My beloved sparkling refreshment of choice. Well, caffeine in all forms, really. This is the exact factor of why I am up at midnight tonight. And I'm pretty pissed about it. Not only because I should be sawing some serious logs right now, but it looks as though my days of slurping down a cold one before, during, and after meals is about to come to an abrupt end. Oh the days. However! I am enjoying the alone time... even if it is in the middle of the night, and I should be doing things other than reorganizing and yet more unpacking. Considering this was the first time I have worn any other form of shoes, I was appalled to see such blatant tan lines. And it's only June. Will I stop wearing the flips? Not a chance. Just recently noticed the train. (can't hear it in our house, thank goodness) I am pretty sure we are on "the right side of the tracks." Heck, I didn't even know trains were still around until recently. I believe I want to walk down there and take the children to look at the trains... before they become extinct... and from a reasonable distance. (obviously) TRAINS! QUASI-COOL! 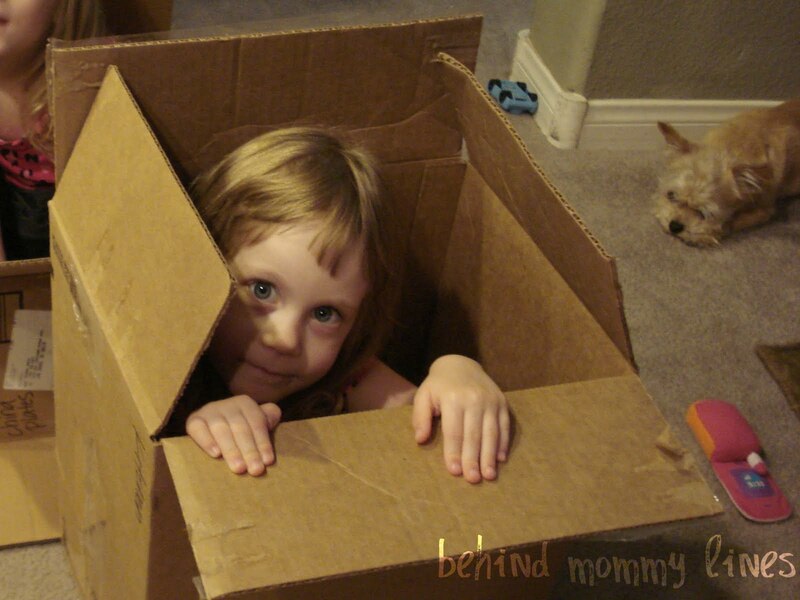 I am trying desperately to get this house unpacked and settled. To find a place for everything and to have everything in it's place. (read: impossible) We have a large pile of things we don't immediately need/want/know what to do with sitting around at our old house. There are also large portions of the old house which are ridiculously dusty- like the four inches of dust under where each bed was placed. And I feel the need to buzz over and make the Old House looked "lived in." (ie: turning lights on and off occasionally) So I am shuttling between the two houses, unpacking here, cleaning up there... it's an insane amount of work for one person to do. I am unsure of just what I will do with all the free time I will have after Old House is closed on and sold entirely. I cannot explain the visceral emotion that boils to the surface when I have to think about going back to the Old House... again. I am working on procuring just the right piece of furniture to house my workspace stuff. I also need to clear a bit of real estate from the dining table. Fortunately for me, the prospect of having the girls eat over carpeting was avoided by stools on the ample kitchen island. I am eternally grateful for that twist of events. However, the kitchen used to be my workstation. (ideal while blogging AND making Mac & Cheese) Now the girls tip over glasses of orange juice... and I'm just not fit to handle that. I miss my light reflecting window film and plantation shutters like the dickens now. (I also miss my GRANITE COUNTERTOPS!) New House is hot as a broiler. No matter how many blackout drapes I hang. I may just fry in this house. Again I am left with the insane thought stuck in my head: "I simply cannot tolerate another desert summer! Cannot do it!" 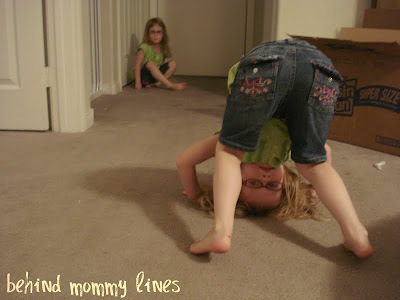 #9- I Googled "Fixing Wobbly Ceiling Fan:"
The girls perfected their somersaulting. It is nothing short of ridiculously adorable. Little Man is in between bouts of teething and is therefore a delight to be around. We went swimming this afternoon- and it was idyllic. Glad you're getting somewhat settled. Hopefully you can put an end to the between-houses thing soon...that is exhausting! My girls used to have a ball playing in the vertical blinds at my mom's. It drove her crazy! We have some blackout drapes over our patio doors, and they are SO much easier.